It’s beautiful, and not a hint of green anywhere. The interface is pretty much just a white rectangle with black text, plus some relaxing blue highlights. But in that simple interface is hidden a lot of power. 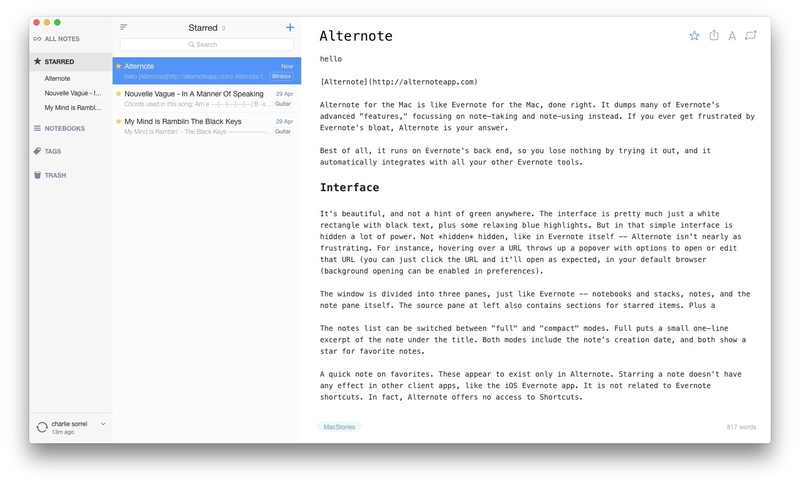 Not hidden hidden, like in Evernote itself – Alternote isn’t nearly as frustrating. For instance, hovering over a URL throws up a popover with options to open or edit that URL (you can just click the URL and it’ll open as expected, in your default browser (background opening can be enabled in preferences). The window is divided into three panes, just like Evernote – notebooks and stacks, notes, and the note pane itself. The source pane at left also contains sections for starred items, plus collapsible sections for notebooks and tags. I especially like the tags section. Evernote forces you to go into a whole separate view, whereas Alternote just gives me a list where I need it. The notes list can be switched between “full” and “compact” modes. Full puts a small one-line excerpt of the note under the title. Both modes include the note’s creation date, and both show a star for favorite notes. A quick note on favorites. These appear to exist only in Alternote. Starring a note doesn’t have any effect in other client apps, like the iOS Evernote app. It is not related to Evernote shortcuts. In fact, Alternote offers no access to Shortcuts. First up, Alternote kind of supports Markdown. If you paste a chunk of Markdown text into a note, nothing happens. It stays as Markdown. If you write in Markdown, inside a note in Alternote, however, the app auto-converts Markdown to rich text. This is – to me – the worst option. I always write in Markdown, and having my hash marks auto-converted into header text isn’t what I want. I want my text to remain in Markdown syntax. It’s nice if the host app displays the text in a nicely formatted way, but it shouldn’t change the source text. That said, if you write in RTF, then you can use Markdown to quickly format your text, make auto-completing lists, or add to-do checkboxes. At the top right of every note you see four icons. 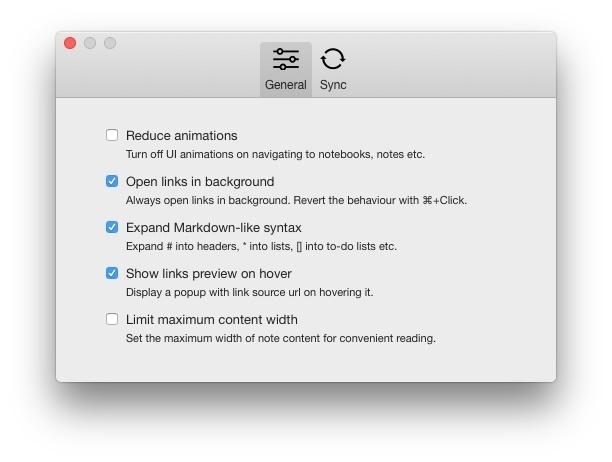 Here you can quickly star a note, share a note (this doesn’t offer the OS X share sheet. Instead it uses Evernote sharing and copies the shared note link to the clipboard). 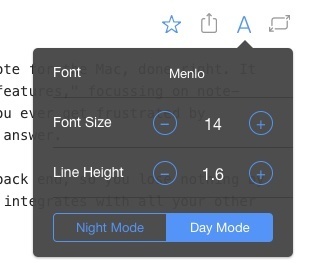 The A button brings up the font dialog, which gives access to controls for font, font size, line height, and day/night mode. There are seven fonts in the list, so you can’t pick Comic Sans even if you have it installed on your system. However, the choice is good (Helvetica Neue, Lato, Clear Sans, Georgia, Palatino, Menlo and Courier), with something for most people. The last icon toggles “Distraction Free” mode, which just hides the sidebars. The bottom of the note shows the word count, and tags. To tag notes, just click at the bottom left of the window (or hit ⌘’) and type. Existing tags are auto-completed. Speaking of keyboard shortcuts, Alternote is full of them. You can navigate the whole app from the keyboard, including switching panes, creating notes, tagging notes. You can also search in all notes or in the current note using shortcuts, and in both cases, search terms are highlighted in the notes themselves. 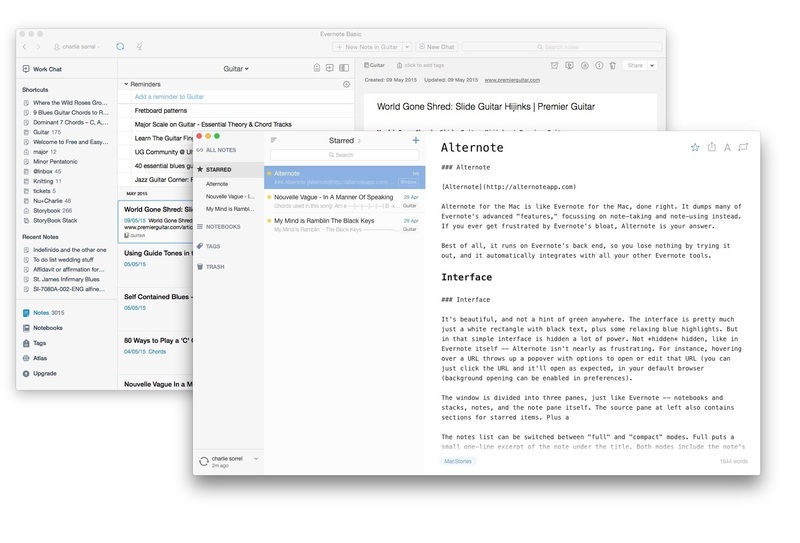 You can flip between sidebar items and the notes themselves, and even star a note, all from the keyboard. Let’s just say that I think Federico is going to like this. Alternote is almost perfect, for my use. I rarely mark up PDFs, I never collaborate on notes and I never, ever enjoy searching a whole separate screen just to find one of my nested notebooks. This simplified version of Evernote is slick, quick and gets out of the way, while syncing flawlessly with my Evernote database. And all for just $5. There are a few too many corners cut though. One is the lack of search inside photos. One of my favorite Evernote features is snapping a photo of a menu or other note, and being able to search on the text in that photo. In fact, comparing search results from the two apps side by side, you get quite different results. I’ll leave you with a something that shows you how much I like Alternote. After trying it out for a short while, I spent several hours searching for something similar on iOS. 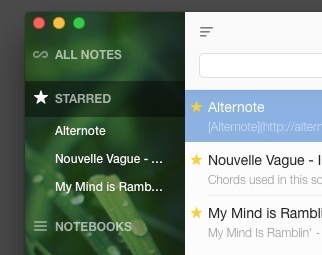 I didn’t find it – yet, but if Alternote made an iOS app I’d pay serious money for it. Alternote on the App Store $5.